This 3D embossed Limited Edition Wonderfully Wicked Pin of the Month is pure [evil] genius! Surely, just ask Ursula. Importantly, the moray eels are worked into the upper sides of the frame. In addition, there is a swirling green mist behind her. Furthermore, as the others in this series have had, there are 3 jewels (purple this time) on the pin and a ‘V” at the top of the frame. Also, pewter finish. Finally, released at both WDW and DLR. Date of Release May 7, 2015. Also, about 1.675” H max dimension and about 1.375” W max dimension. Indeed, buy this Disney Wonderfully Wicked Ursula The Little Mermaid Villain Limited Edition Pin. Above all, you will enjoy this great collectible Disneyana gift for yourself and/or someone you know will love it. Disney’s “Wonderfully Wicked” collection showcases some of the most famous Disney villains. 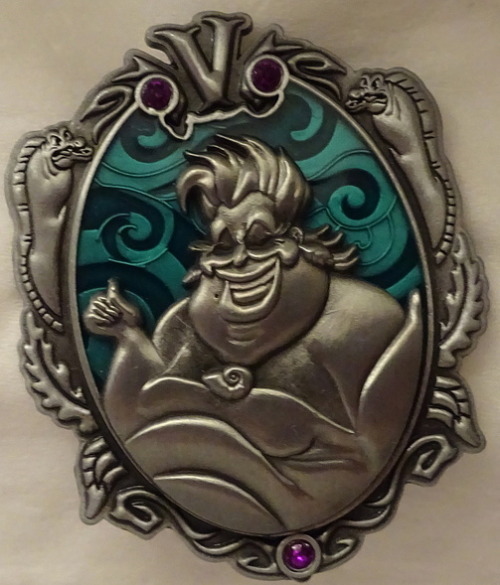 This listing is for one pin in the series – Ursula The Little Mermaid Villain Pin.